I am not sure if it is a good thing or a bad thing that my kids are accustomed to getting what ever style of birthday they want. It started when they were infants and I was choosing what I wanted the parties to be like. I love to be different, turns out that has come back to bite me in the patootie! Now they are old enough to choose, and they don't always choose what I am motivated to create. Well, it's their birthday... their one day a year... shouldn't I give them what they want? This year my son asked for a Lego Bionicle Mask of Light birthday party... and of course there is no party supplies to be found for the Mask of Light. Most parents would have them choose another theme. But my kids know better... they know now that Mommy can make it happen even if I can't buy it from the store. This year was especially hard. I tried to convince my son to change his mind, because we were in the process of laying 450 sq ft of hardwood floors the two weeks before his party. But he had his sweet little hart set on the Bionicle Mask of Light. So after 12 - 16 hr days of working on laying and cutting and designing hardwood flooring... this is what I stayed up late at night working on. This next pic you can see how the text sheet just pulls down. It is pretty simple mechanics to make it do this... the hard part is telling everyone that is how it opens... LOL. This was layered with two 1/2 sheet cakes. 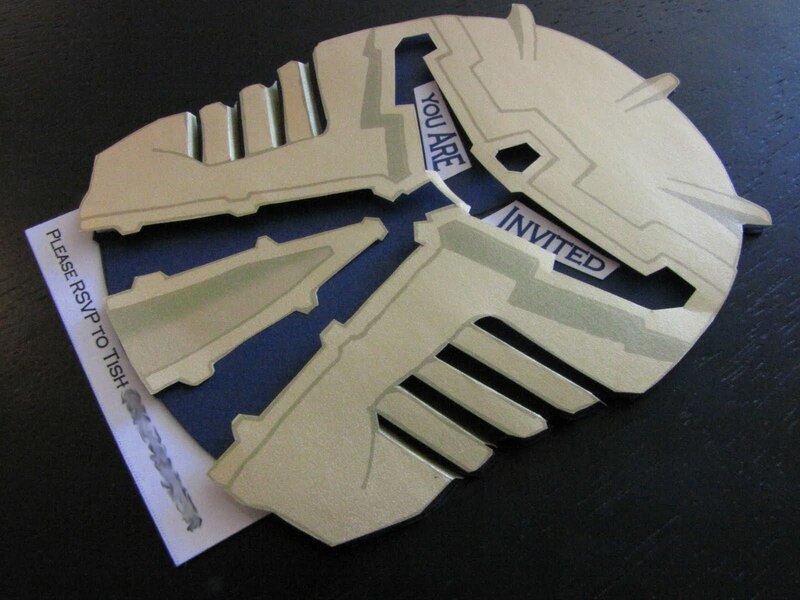 The bottom layer is a 1/2 sheet and the top was carved down into the shape of the Mask of Light. The both layers of the cake were iced and completely decorated before assembling them. Then the piping was added around the Mask to join them together. Tristan was so happy with the result. He is always so proud of his Mama and the things I create. I love my little man so much! So much, we put trick candles on the cake... I have a pretty funny video of him and about 3 other kids trying to blow them all out. I created the little topper of the cupcakes on the computer... they were 1" square. I printed them so that the image square was upside down touching the top of the text square. This way when I cut them out I cut them 1" x 2". Folded them in half over a toothpick after adding some mono adhesive to the back of each topper. The kids loved this! It was supper easy and more of them got excited about his party coming up later that weekend. Thank you so much for checking these out. I was thrilled to make them for my little man. 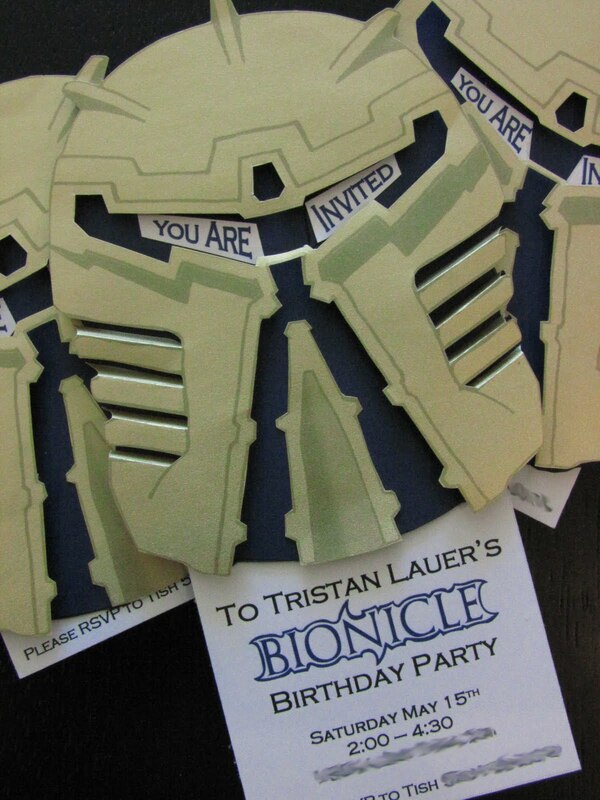 I am not a crazy stalker, your post came up on my "Bionicle cake" search. That being said, my goodness! 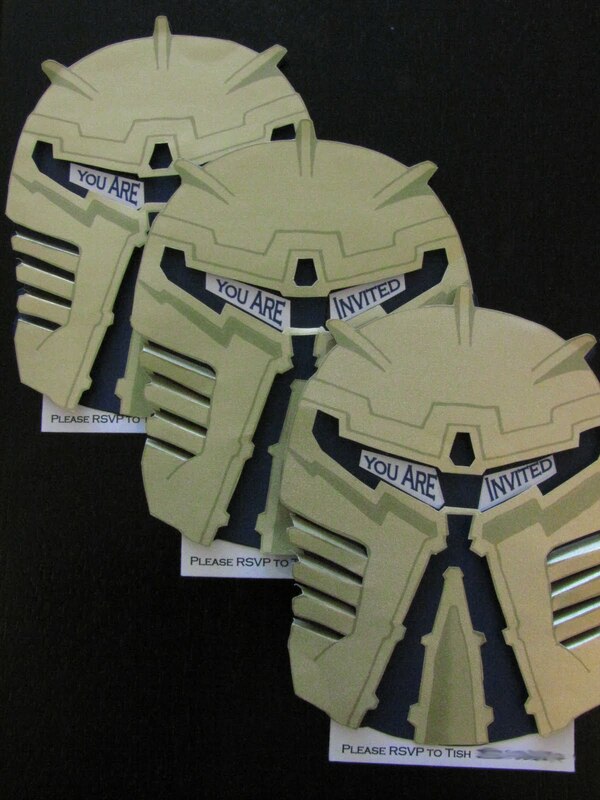 I am looking to throw a small Bionicle party for my son and he must never see this. I can't have him knowing there are better moms out there. Well done! The email address you left is not working for me. Please email me direct at littlelauer@hotmail.com. Thanks!